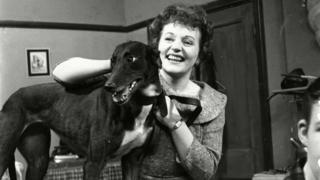 Actress Doreen Keogh, who played the first Coronation Street barmaid, has died aged 91. Keogh pulled Rovers Returns' first pints as Concepta Riley, starring in the soap in the 1960s and 70s. The Irish star also had recurring roles in Cold Feet, Father Ted and the Royle Family. ITV Studios' creative director John Whiston said Keogh holds a "unique place" in Coronation Street history. "There have been many barmaids in the Rovers over the years, dispensing pints and wisdom in equal measure," he said. "But Doreen played the first and so has a unique place not just in the history of the show but in the affection of all who watch The Street." Keogh starred as Mary Carroll, the Royles' neighbour, in The Royle Family, and as Pete Gifford's mother Audrey in Cold Feet. In the 1990s she played the character Mrs Dineen in two episodes of Father Ted. Fans will remember her having a fight over paying a bill at a tea shop. She is also credited with coaching Barbra Streisand on how to speak with a cockney accent for her film On a Clear Day You Can See Forever, despite being a Dublin native, her family said. Her niece and nephews Laurence, Matthew and Christina Keogh said in a statement: "Our auntie Doreen died peacefully in Thomastown, Co Kilkenny, Ireland, on New Year's Eve after a long illness. "She is known for the parts she played in prominent TV series including Coronation Street, Ballykissangel, Father Ted, The Royle Family, Cold Feet, Fair City, Z Cars, Crossroads and others. "She also had many stage and film roles, including a part in the 1960 Blake Edwards-directed musical Darling Lili with Julie Andrews and Rock Hudson."